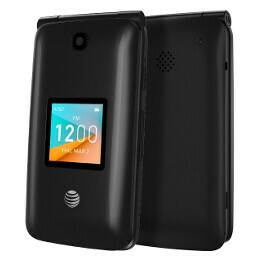 AT&T recently released a brand new clamshell phone (aka flip phone) aimed at users who simply don't need a smartphone. Called Cingular Flip 2, the handset is a rebranded Alcatel Go Flip (which was launched last month by T-Mobile), and succeeds a Cingular Flip introduced by AT&T back in 2016. The AT&T Cingular Flip 2 features a large physical keypad, a 2.8-inch internal display with 240 x 320 pixels, and a smaller external screen of unknown resolution - good for peeking at notifications without flipping the phone open. The new clamshell is powered by a quad-core Qualcomm Snapdragon 210 processor, and lets users connect to the internet via both LTE, and Wi-Fi. Other features include HD Voice, A-GPS, FM Radio, 4 GB of on-board storage space, microSD card support, and a 1350 mAh battery. There's also a 2 MP camera on board (with 720p video recording). AT&T is selling the Cingular Flip 2 for $59.99, though you'll also have to pay a $25 activation fee to use the phone. You can order the device online via the source link below. Ah the flip phones. Remember those days before the fanboys? FM radio and microSD card support? This thing is better equipped than most flagships.